This online course is intended to immerse the student in the world of botany to gain foundational understanding and retain information throughout the course of study. 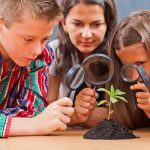 Topics include: seeds, flowers, pollination, fruits, leaves, roots, stems, trees, gymnosperms, vascular and non-vascular plants. Students will enjoy the hands-on approach with several projects and experiments. They will also learn how to write basic lab reports, listen in class, take notes, and study for tests. Lab kits are not provided. Projects and labs will use many household items, but other materials such as seeds and potting soil will need to be purchased.